In the years following World War II, electronic computer makers and users developed techniques for programming of the newly invented devices. Fledgling manufacturers sought to communicate possible uses of their machines to customers and to train people to program them. To assist in these endeavors, they used special diagrams called flow charts. By the mid-1950s, such efforts had generated a new drawing instrument, the flowcharting template, a plastic rectangle with the symbols needed to draw flow charts cut out of it. Nathan Ensmenger, “The Multiple Meanings of a Flowchart,” Information & Culture 51, no. 3 (August 2016), pp. 321–51. Thomas Haigh, Mark Priestley, and Crispin Rope, ENIAC in Action: Making and Remaking the Modern Computer, Cambridge: MIT Press (2016) esp. 74-79, 204-206. This article discusses charts made for the ENIAC computer. Grace M. Hopper, The Calculation of Extended Insurance, Philadelphia, 1950. A photocopy of this document is in the collection of unprocessed computer documentation at the National Museum of American History. It uses flowcharts to describe the UNIVAC I computer. Robert J. Rossheim, “Report on Proposed American Standard Flowchart Symbols for Information Processing,” Communications of the ACM 6, no. 10 (October 1963), pp. 599-604. This clear plastic flowcharting template has a grid of lines marked on it., with some line segments darkened to assist in aligning the symbols on a flowchart. Many of the twenty-six symbols are labeled. A scale of printer spacing runs from 0 to 90 across the top and a scale of card volume runs from 0 to 450 on the left. The white paper envelope holding the template explains many of the symbols. A mark on the bottom right reads: ELECTRONIC DATA PROCESSING RCA (/) 28-00-108. A reference mentioned on envelope is: RCA EDP Manual, Flow Charting Standards for Information Processing, 97-05-001. RCA sold computers from 1958 until 1971. It had embraced the flow chart [sic] as a tool of industrial design by 1960. RCA Engineer, vol. 6, #4, December 1960-January 1961. This issue of the magazine includes several flow charts. This plastic template has ten flow chart symbols. A scale of inches divided to sixths is on the right, a scale of inches divided to tenths on the left, a scale of inches divided to twelfths at the top, and a scale of inches divided to sixteenths at the bottom. A mark reads: ElectroData (/) DIVISION OF BURROUGHS. Burroughs purchased Electrodata in 1956 and began selling the Electrodata Datatron 220 in the following year. Trade literature indicates that the Electrodata Division of Burroughs continued until at least 1960. Flow charts could describe accounting machines as well as computers. This clear plastic rule is colored white around the edges. It has a grid of lines drawn in the background, with twelve symbols cut out. Across the top is a scale for 402-403 type bar spacing. Across the bottom are scales of mark sensing and card column numbers. Along the left is a scale of line spaces. Along the right is a scale of punching positions. The IBM 402 and IBM 403 were IBM accounting machines that sold from the late 1940s into the mid-1960s. 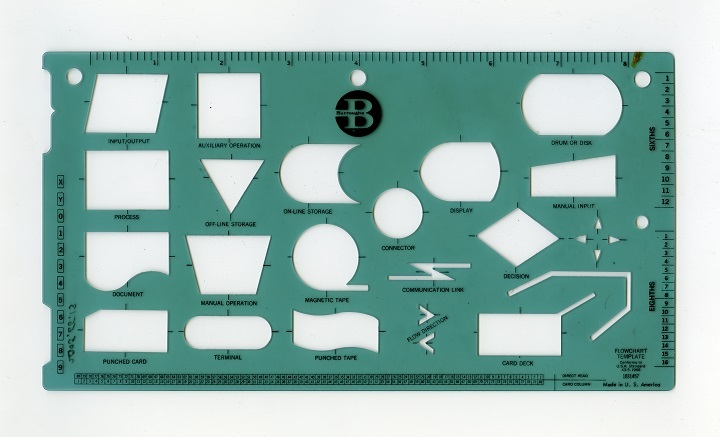 This clear plastic flowcharting template also has a seven inch scale of equal parts along the bottom divided to tenths, a three inch scale on the right side divided to sixths, a 6 7/8" scale along the top divided to eighths, and a scale of card volume along the left side that runs from 0 to 400. The twenty-one holes in the template are not labeled. A mark reads: Honeywell (/) Electronic Data Processing. The Electronic Data Processing Division of Honeywell was in business under that name from at least 1961 through 1971. The symbols used suggest that the template dates from before 1966. This rectangular yellow translucent plastic flowcharting template has a rule six inches long divided to thirty-seconds of an inch along the top edge, and a rule ten centimeters long divided to millimeters along the bottom edge. Twenty-one holes represent flowcharting symbols. A mark along the top reads: LOGIC SYMBOLS for use with UNICIRCUIT INTEGRATED CIRCUITS. A mark at the lower left reads: ASP 376. A mark next to this one reads: SPRAGUE (/) THE MARK OF RELIABILITY. The trademark UNICIRCUIT was first used in commerce by Sprague Electric Company Corporation of North Adams, Massachusetts, in December 1962 and granted December 31, 1963. The mark on the object indicates that the trademark had been registered. The holes on the template are only partially those proposed by subcommittee S3.6 of the American Standards Association and released in 1965. This template is similar but not identical to one shown in the catalogue for RapiDesign, Incorporated, of Burbank, California in 1963. It had their model number 541. TESS, U.S. Patent and Trademark Office, Trademark Registration 0762224. Robert J. Rossheim, “Report on Proposed American Flowchart Symbols for Information Processing,” Communications of the ACM, vol. 6 #10, October, 1963, pp. 599-604. RapiDesign, Inc., Drafting Templates Catalogue No. 70, Burbank, California, 1963, p. 16. This translucent green flowcharting template has a grid of black lines, with twenty-four symbols cut out of it. Three additional cutouts are along the edges. Symbols are not labeled. A six-inch scale along the bottom of the template is divided to sixths of an inch. One along the top is divided to tenths of an inch. Text on the template reads: COMPUTER DIAGRAMMING TEMPLATE. Further text reads: THE BUNKER-RAMO CORPORATION. Bunker-Ramo Corporation formed in 1964 as an electronic information-handling company, joining together the electronics system and products division of the Martin-Marietta Corporation, the Teleregister Corporation, and the computer division of Thompson Ramo Wooldridge. One early achievement of the company was a bibliographic system known as RECON developed for NASA. In 1981, the firm was acquired by Allied Corporation. William Mitchell, “The Genesis of NASA RECON,” The History and Heritage of Scientific and Technological Information Systems, ed. W. Boyd Rayward and Mary Ellen Bowden, Medford, NJ: Chemical Heritage Foundation, 2004, pp. 228-245. Robert J. Cole, “Allied Pays $358 Million for Bunker,” New York Times, May 12, 1981, p. D1. RapiDesign, Inc., Drafting Templates Catalogue No. 70, Burbank, California, 1963, p. 14. This clear plastic flowcharting template has over thirty symbols cut out of it. Scales relating to the design of punch cards are on the left side and the bottom, a scale of inches divided to tenths is at the top, and scales of sixths and eighths of inches are on the right edge. A paper envelope explains the symbols. A mark on the object reads: B. The logo is one that Burroughs Corporation first used in commerce in 1947 and registered in 1969. Another mark reads: THE FLOWCHART TEMPLATE CONTAINED IN THIS ENVELOPE 9/0 IS A SERVICE OF BURROUGHS CORPORATION. . . . Another mark on the envelope mentions Burroughs computers E103, B205, B220, B260, B270, B251, and B5000. This combination of products dates the template to roughly 1965.